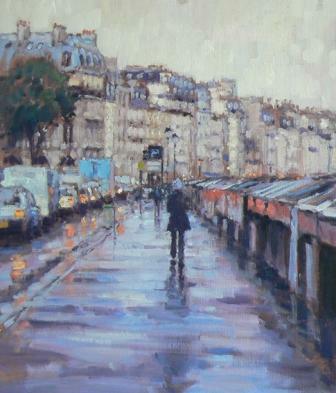 ''Early Morning Rain, Paris'' reflects David Farren''s passion for painting cityscapes. He loves to paint and depict urban day-to-day scenes and excels in capturing the atmosphere of city life. David Farren is fascinated by the way that varied light affects a scene and has a great fondness for European cities with their mixture of old and new architecture. Against this urban background he concentrates on the people as they go about their everyday business. His paintings record moments of everyday life. ''Early Morning Rain, Paris'' is typical of David''s observational skills and demonstrates his mastery in painting scenes containing reflective light.